Average Height	: 9" - 30"
Average Weight	: 5 - 40 lbs. The Xoloitzcuintli, also spelled Xoloitzcuintle, is more commonly known as the Mexican Hairless or Xolo. It resembles a robust Manchester Terrier. It comes in three sizes - toy, miniature and standard, and two varieties - hairless and coated. In the hairless variety, the skin is tough, protective, smooth and close fitting. The Xolo is one of the world's oldest and rarest breeds. They have been around for more than 3000 years, and are depicted in art and pottery of ancient civilizations like the Mayans and the Aztecs. It is believed that the ancestors of the Aztecs brought hairless dogs with them when the came from Asia. The dogs were prized for their loyalty and intelligence but were also believed to have mystical powers. The ancient civilizations used the Xolos for family pets, but they were also highly prized as living bed warmers. The Xolo's hairless body radiates warmth, so they were often used to help the people stay warm or as a sort of heating pad for aches and pains. They were also sometimes used for food and sacrificial offerings. Xolos differ from most other breeds in the fact that they were not bred for a specific purpose. Therefore, their characteristics have developed through natural selection and a need simply to survive as a breed. The breed is native to Mexico, but can be found all throughout South America. The name comes from the ancient dog Xoloti. By the end of the 19th century, the dog had become solely a dog for companionship and their popularity is still on the increase, particularly in the United States. The coated variety is covered by a short, flat coat. Today, this breed serves as a guard and companion. The typical Xolo temperament is calm, tranquil, aloof and attentive. They make excellent companion dogs with moderate exercise and grooming needs. •	Hardy and healthy breed, possessing no known breed-related health concerns. •	Skin Problems can arise with both neglect or over-bathing. •	Need daily walks. Require lots of exercise, discipline and attention. •	Very hardy and adapts to many lifestyles. •	Also they come in various sizes. •	Must be protected from severe cold and hot weather. •	Do not leave these dogs outdoors or in kennels. 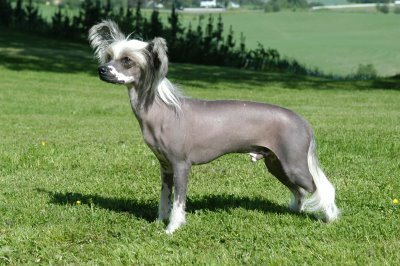 There are two varieties of the Xoloitzcuintli; the coated and the hairless. The hairless has proven to be the more popular of the two varieties. This variety should be completely hairless with the exception of a short tuft of hair on the head and tail. Their skin should be soft and smooth; any hair other than the tufts is considered a fault. The coated Xolo has a full coat of hair, but it is very short and sleek. In either variety, none of the hair should be wiry or curly. The hairless variety of the Xolo has thick, tough skin that is very protective. When puppies are born, they have an abundance of wrinkly skin that they will grow into. The outline of the Xolo should be clean and graceful - they should look somewhat rectangular, but with no extremes noted in their bodies. They should be slightly longer than they are tall. There are also three sizes of the Xolo, most commonly known in the US as the Mexican Hairless. They are the toy, the miniature and the standard. The toys weigh as little as ten pounds, the standard up to 50 pounds. They have sleek bodies with a long neck, large, bat like ears and almond shaped eyes that are dark in color and go well with the color of the coat. Often, they are missing several teeth. Xolos often change color from puppy hood to maturity. The hairless variety of Xolo is perfect for the dog allergic family; no hair means no dander, no fleas, no allergies! This is a very athletic and very loving dog. They bond strongly. They are very loyal and intelligent. They have excellent hearing and are very quick to alert you to strangers in the yard. They are naturally wary of strangers and don't warm up to new people right away. They should be socialized early to make them comfortable with guests in the home and with small children. The Xolo is very intuitive and somewhat dominant in nature. It's important that you teach your Xolo early on who's boss, or he'll gladly be the boss of the home. They seem to be very tuned in to what's going on in the family, and with time, will behave appropriately for the current situation. The Xolo loves its owner and is not prone to run off. In fact, once properly trained, you can likely walk your Xolo without a leash, and he'll stay right beside you. This is one dog that will always come when you call him; in fact, he's probably very nearby. While the Xolo is prone to stay with you, he is a great escape artist when he wants to be. By nature, they are not likely to stray, but it's still important to have a secure fence if you're planning to let your Xolo out in the yard alone. This breed is one of the very best climbers of any breed of dog. Some owners report that their Xolo regularly climbs trees. The Xolo is a very good guard dog; while they are small, they are not yippy. If they are barking, it's to alert you to something. In general, this is a very hardy and healthy breed. There are no known Health Problems specific to this breed. However, as with any breed, it's important to know the breeder before you purchase. Choosing a responsible breeder helps to ensure that the dog you're purchasing is free from close Breeding practices and comes from parentage that is certain and that has been well taken care of. It's also important to ensure that your dog gets regular veterinary care to be certain that he has all important vaccinations and Routine preventative treatments, such as heartworm medication and flea prevention. This is a very easy breed of dog to groom, whether short haired or hairless. Hairless- These dogs can experience skin problems, if they are not properly taken care of. They should not be over bathed or have too much lotion put on them, as this strips the body's natural protection and causes pores to get clogged. They do need sunscreen when out in the sun for extended periods of time. Sunscreen designed for babies works well. In general, your Xolo needs to be bathed and rubbed in lotion about once a month. Most breeder recommend using very mild human products for Xolos - baby shampoo works well for the bath and unscented lotion products work well. Between baths, you can simply rinse the dog occasionally with warm water to remove surface dirt. Coated - The coat should be brushed weekly to minimize shedding. They can be bathed occasionally, too. Use mild dog shampoo to bathe the coated Xolo. If your Xolo is light colored or has white spots in his fur, he too will need sunscreen on these spots as they can burn. The Xolo needs a lot of exercise. While they are happiest and most suited to living indoors with their families, they do love to get out and run. They'll also love to play with toys and the smaller Xolos can get a lot of exercise playing in the house. They're great companions when you go on walks, etc, as long as they're protected from the elements. When they're puppies, they will be bursting with energy and are likely to get into things if they're not given the opportunity to run off their energy. As they mature, this will be less of an issue. The Xolo is intelligent and fairly easy to train. However, as a puppy, they will need lots of discipline and attention in order to teach them acceptable behavior. The Xolo will bond with the person who cares for him, feeds him, plays with him and trains him. For this reason, if your Xolo is to be a family dog, it's important to get every member of the family involved in the puppy's care and training. Otherwise, you risk him being a "one person dog". They can certainly be house trained. However, many owners choose to paper train the small hairless varieties to avoid having them have to go out in the cold during winter. (The hairless variety would need a sweater to go outside in very cold weather.) Crate training works well for this breed. In addition to being a great way to housebreak them, it provides them a bed that they will grow quite attached to. It's important to establish dominance over the Xolo, as they have a bit of a dominant personality. But, once you establish yourself as the Alpha dog in the house, they will be loyal and quite happily listen to your commands. Positive training always works better than negative training. Give your Xolo puppy lots of attention and reward him for good behavior. Negative training is inappropriate for most breeds. But, in particular, the Xolo will respond poorly if too much negative training is used. Of course, you will point out when they've behaved inappropriately, particularly if you've "caught them in the act", but the best training method of all is to "catch them doing something right" and praise them lavishly. It is particularly important to socialize the Xolo puppy from a young age. This breed is naturally wary of strangers, and while you do want them to be a good guard dog, you also want them to be social with your friends and family. Consider joining a "puppy social"" group. Not only will it be fun for you to meet other puppy owners, but it will give your dog a chance to get comfortable around strange people and strange dogs. In puppy socials, puppies get introduced to other puppies both on leash and later, off leash. They learn to play together appropriately, share water bowls and share toys. It's essential that the experience be completely positive for the puppies. If they have negative experiences in this environment, they may become fearful of other dogs at a young age. There are other ways to socialize your puppy, and the easiest is just to take them with you whenever you can. And fortunately, toy and miniature Xolos are of a size that makes it quite easy to take them along. In addition, Xolos enjoy the company of their humans so much that he'll be quite happy to accompany you anywhere. Your Xolo will love to entertain you, so teach him some tricks that he can perform to delight his audience. This is also a great way to socialize him with strangers, since he will love the attention he gets from performing for your guests.